This stunning image is an inkjet Gallery Print, 24"w by 18"h in size, printed on high quality photographic paper. Suggested Retail Price = $ 25.00. Ready for mounting and framing. Hubble's Largest Galaxy Portrait Offers a New High-Def View. Giant galaxies weren’t assembled in a day. Neither was this Hubble Space Telescope image of the face-on spiral galaxy Messier 101 (M101). It is the largest and most detailed photo of a spiral galaxy that has ever been released from Hubble. The galaxy’s portrait is actually composed of 51 individual exposures taken with Hubble's Advanced Camera for Surveys and the Wide Field and Planetary Camera 2 in March 1994, September 1994, June 1999, November 2002, and January 2003. The newly composed image also includes elements from images from ground-based photos. This photograph of M101, nicknamed the Pinwheel Galaxy, showcases a spiral galaxy’s well-known features. A galaxy is a collection of stars, gas, and dust held together by gravity. 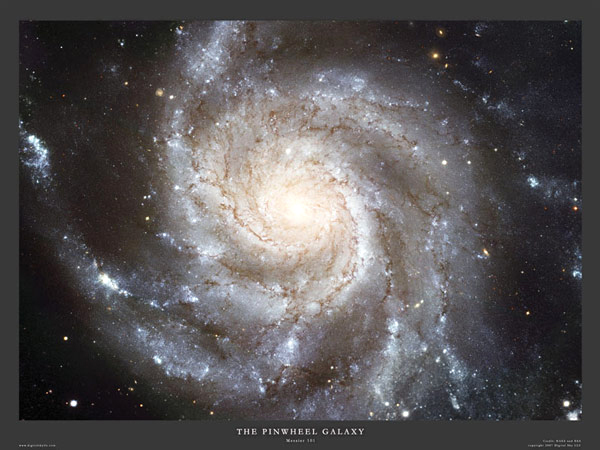 Galaxies come in three different varieties: spirals, ellipticals, and irregulars. Spiral galaxies, like M101, have well-defined spiral arms that wind around the galaxy within a rotating pancake-shaped disk of material. In this Hubble telescope “face-on” view of M101, bright blue areas of star formation pepper the spiral arms, which look like the arms of a pinwheel. Dark, thin dust lanes follow the spiral structure into a yellowish central bulge containing older stars. In fact, M101’s disk is so thin that the Hubble telescope easily sees many more distant galaxies lying behind it. Seeing these background galaxies shows that a galaxy’s disk is really mostly empty space. The Hubble image of M101 is 95,000 light-years across. A beam of light would travel 95,000 years to get from one side of the pictured galaxy to the other. M101 is estimated to contain hundreds of billions of stars. If each star were a drop of water, one would need about five Olympic-size swimming pools to hold the hundreds of billions of stars. Many of the stars are smaller, cooler, and redder than our Sun. The hot, blue stars along the spiral arms are rare, but they are so bright they stand out in this image. The galaxy lies 25 million light-years from Earth in the northern constellation Ursa Major (The Great Bear). We are seeing M101 as it looked 25 million years ago. The light we are seeing from the galaxy began its journey to Earth at the beginning of our planet’s Miocene Period, when mammals flourished and the Mastodon first appeared.